Lets begin our mtbethelchurchIGH.org 2013 year in review at July/ August when Mt Bethel Church re-vamped the website. We did away with a long clumsy web address and clunky web design. The decision was made to use our new and improved webpage format to communicate mission and ministry of Mt Bethel United Methodist Church, Inver Grove Heights MN. This website is our church 'newsletter'. Our website remodel became possible through a Healthy Small Church initiative grant through the MN Conference. June 2013 saw Mt Bethel Church say goodbye to Pastor John McEachran who had faithfully served Mt. Bethel Church for 14 years. Pastors John and Judy McEachran went to lead St. Croix Valley UMC and now are serving Fourth Avenue UM Church in Faribault MN. We Welcomed Pastor David E Brown aka Pastor Dave to Mt Bethel Church. “Back to School Bash” is a local ministry providing backpacks with school supplies to IGH kids in need. Those in need of backpack school supply assistance filled out the registration form or contacted the Inver Hills Church office at info@inverhillschurch.org or (651) 451-3796. Mt. Bethel’s goal in this community ministry was to fill 25 or more backpacks. We definitely exceeded that goal. IGH Churches gathered on Wednesday, August 14th, at Inver Hills Church to fill - coordinate backpacks for Saturday, August 17th 4-7pm backpack distribution at the Back to School Bash - grounds of Inver Hills Church. August 28, 2013: Hilltop Elementary is located just down the street from the church. Mt. Bethel provided and Pastor Dave and 5 others served lunch to staff members at Hilltop Elm during teacher workshop week (Over 55 staff were served). Additionally each teacher was also given a hand written note and gift card to Caribou Coffee. Lunch, notes and gift cards was done to express our gratitude for all they (Hilltop's faculty & staff) do for the children in our Inver Grove Height's school district. Hilltop faculty & staff were very touched and appreciative for this recognition. Serving together on 2013 at Feed My Starving Children the 3rd Wednesday of each month, 9:30 – 11:30am at the Eagan location, 12 to 20 members and friends of Mt Bethel Church serve together at Feed My Starving Children. Often times at the conclusion of the work shift the fellowship continues as participants gather at a local restaurant for lunch too. The sign-up sheet for this serving together fellowship is located on the bulletin board at the back of the fellowship hall. Thank you for the many hours of generosity in giving through serving and offerings. 20 year Power Prayers small group Anniversary. Power Prayers small group began meeting August 1993. The first morning this small group of prayers gathered, an early morning storm was brewing outside. While in prayer, the church was struck by lightning. Those present took it as a sign – prayer IS powerful. Currently at 6-6:30am Monday mornings Power Prayers small group rejoices in the goodness and blessing of 20 years faithfully gathering for prayer. May we pray for you? May we lift joy or your burden to the Lord? Power Prayers share joys & burdens, we read scripture, talk, pray and bless each other as we enter the week's opportunity(s) to show others Christ and pray. September: We participated in a week of all out Praying for Peace in Syria. A message from Bishop Bruce Ough who oversees the Dakotas-Minnesota Episcopal Area of the United Methodist Church. Bishop Ough facilitates strategies for equipping Christians for service in the church and world. Pastor Dave and Bishop Ough's message, Seek Guidance From God, pray. In October & November 2013, members & friends of Mt Bethel Church met with Pastor Dave in 9 small group conversation settings. Thank you for making time in your busy schedule to participate in this 'meet the Pastor' opportunity and for Pastor Dave to meet you. To those who opened your home or hosted a gathering at Church, thank you for your hospitality. Blessings to us all as we grow in love and relationship. 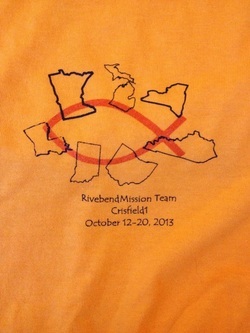 3- Take a virtual mission trip with us via Rod Scofield's blog page. Generous God, Generous living in action. The week of November 18th members and friends of Mt Bethel Church assembled and delivered 52 stuffed shoe boxes for Samaritan's Purse Operation Christmas Child. Much goodness was received in packing boxes in Jesus' name to provide spiritual and physical aid to hurting children around the world. Thanks to our MOE (Missions, Outreach & Evangelism) team who coordinated and delivered our efforts. Generous God, Generous Living in practice- Mt. Bethel Church is a collecting location for Neighbors Inc Food shelf- Each month our Missions, Outreach & Evangelism team packs up our donations and take them over to Neighbors Inc building in South St. Paul. Neighbors Inc. is a non-profit, social-service agency serving the Northern Dakota County communities of Inver Grove Heights, South St. Paul, West St. Paul, Mendota Heights, Mendota, Sunfish Lake and Lilydale. Neighbors Inc provides emergency assistance and supportive assistance programs. Mt Bethel Church is one of the founding churches establishing Neighbors Inc. in 1972 and remains an active partner today. In November Mt. Bethel Church delivered over 390 pounds of food & toiletry supplies to Neighbors Inc.
Mt. Bethel had a team participating in the Walk to End Hunger on Thanksgiving Day 2013. Members & friends of Mt. Bethel Church could participate by joining the team walking &/or by making a donation to end hunger. Our Team Leader was Tim Bomstad. Our Walk to End Hunger dollars will go back into our community through Neighbors Inc food shelf. As of Thanksgiving morn, Mt. Bethel's team in the Walk to End Hunger with walking leader Tim Bomstad, raised $750 for Neighbors Inc food shelf. (the goal was $500.) Thank you for your generosity to help end hunger in our community. Pop culture and popular psychology tells us to make ourselves the center of the universe in order to be happy. In IT'S NOT ABOUT ME, author Max Lucado reminds us that it's not about us, it's all about God. Through a shift in thinking that we can truly live an unburdened, happy life. Woman's book study- women gathering in home of participants, occasionally at church, to cultivate their spirituality. United Methodist Committee on Relief - UMCOR. Provides immediate help in time of need disasters globally and in the USA. UMCOR is in the Philippines right NOW. Typhoon Haiyan caused extensive damage in the Philippines and surrounding area, destroying about 41,000 homes, displacing at least 670,000 people, and affecting a total of 11.3 million people. Thank you for placing your generous donation in the offering basket on Sunday marked UMCOR or giving online donation. Our Deepest Sympathy is expressed to the Richard Christiansen family. Our Deepest Sympathy is expressed to the Shirley Kappel family. Christmas Open House at Pastor Dave & Lisa’s Dec. 21st. Over the river, and through the wood,to Pastor's house we go; the GPS knows the way to guide the sleigh through the white and drifting snow. Over the river and through the fields - when Lisa sees us come, She will say, "O, Dave, the Church Family are here bring the cookies for every one." Over the river, across the fields to Pastor's house 40 some of us did go..... for blessed hospitality from Pastor Dave & Lisa. Thank you for Romans 12:4-8 goodness. Christmas Program Sunday, Dec. 22nd, during our worship service the children & youth of Mt Bethel Church told the Christmas story. Many of you attended. Thank you for coming to see, hear and ring bells for Jesus is the King! born to you and me. Christmas Caroling Friday evening, December 20th, members & friends of Mt. Bethel Church caroled around the block to homes neighboring the church. Afterwards 20some carolers return to church for cookies and hot cocoa. The Annual Epiphany Service at Old Salem Shrine ended up being cancelled due to the EXTREME COLD temperatures. The customs of the 1800’s singing of traditional Christmas carols by kerosene lanterns with the antique pump organ and wood stove as our ancestors might have done- was put on hold. Old Salem, located at 1505 Upper 55th St. in Inver Grove Heights, is the first Evangelical church in the State of Minnesota and the birthplace of the Evangelical United Brethren denomination prior to its merger with the Methodist Church. Generous Christmas time Giving. In 2010 Mt. Bethel Church made a 3-year pledge of $3000 to Imagine No Malaria by the conclusion of 2013. The plan to end Malaria- click here. Through generous 2013 Christmas-time offerings, Mt Bethel Church exceeded our pledge and has offered $3840 to Imagine No Malaria mission and ministry. Thank you for your generosity of offering Christ by Outwardly Utilizing Talents Reverently Extending A Christian Hand (OUTREACH) in imagining no malaria . Mt Bethel 2013 SCRIPT facts: 39 families participated in the Shop with SCRIPT program. Ranging from $20 to over $11,000 in purchased SCRIPT shopping cards for groceries, fuel, dining, pharmacy, clothing and gift giving. In 2013, Mt Bethel's general ministry fund received $1148 SCRIPT rebates and $768 to the Endowment Fund. Thank you for shopping with SCRIP. It is making a difference as we "offer them Christ". Thank you to Linda E, Judy A, Bill B and Joann N who coordinate Shop with SCRIPT at Mt Bethel. Remember Mt Bethel Church in your estate planning.